Novi, MI –Vision Research, a leading manufacturer of digital high‑speed imaging systems, recently debuted the Phantom® Miro® N-Series, the latest addition to its line of Phantom Miro high-speed cameras. 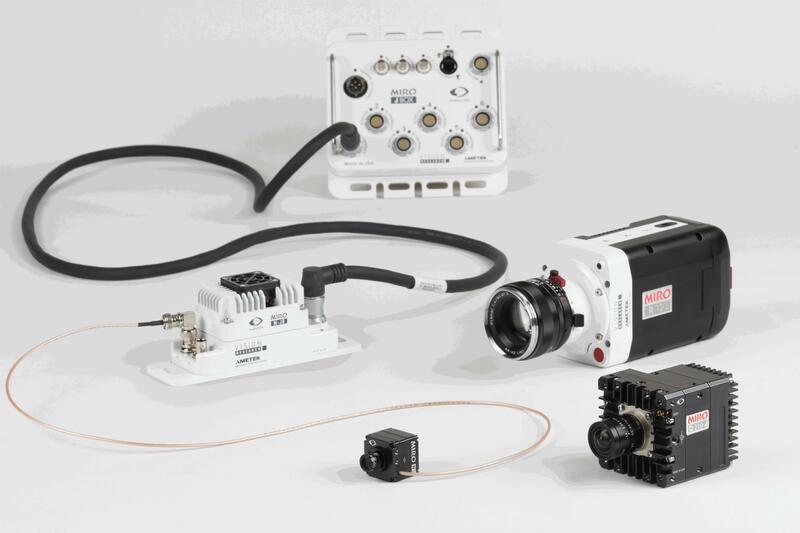 With a camera head measuring in at just 32mm x 32mm x 29mm, the Miro N-Series is the smallest model in Vision Research’s robust line of digital high-speed cameras. It was specifically designed to capture footage from locations that were never before accessible. The Miro N5’s cube-shaped camera head is completely removed from the camera’s body resulting in an incredibly small camera that can be mounted just about anywhere. Coupled with its hi-G construction (tested to withstand impacts up to 150G), the Miro N5 is ideally suited for hostile and extreme environments, where the capture of multiple angles and points of view are critical, such as auto crash and aerospace testing. Despite its compact size, the Miro N5 offers all of the performance expected from a Phantom high-speed camera. At its full resolution of 768x600, the Miro N5 camera head delivers 560 frames-per-second (fps) and can achieve over 9,000 fps at lower resolutions. Users also benefit from Extreme Dynamic Range (EDR) for exceptional image quality in high-contrast lighting conditions, as well as Vision Research’s Image Based Auto Trigger (IBAT), which will automatically trigger recording once the camera detects a change within the frame. The camera head has a fixed aperture and accepts readily available, miniature S-mount lenses, which come in a variety of fields of view (FOV). The Phantom Miro N-Series is comprised of the camera head, a detached camera base, and a 10m CXP cable. Information is instantaneously transferred from the camera head to the Miro N-JB base using a CXP cable and CoaXPress protocol. Since data security is a concern while filming in harsh environments, the CoaxPress protocol and CXP cabling ensures that vital data is captured, transferred and stored instantaneously to the base, even in the event that the camera head is damaged or a cable is severed. Once transferred to the base, images can be stored on 8GB of onboard RAM or 128GB of non-volatile CineFlash memory until they can be retrieved. Moreover, in the event of power loss, the Miro N-JB base incorporates a battery backup which will continue to feed power until the images and the data are safely saved. All components of the Phantom Miro N-Series are interchangeable for maximum convenience and flexibility. Due to the nature of high-impact testing, the risk of damage to expensive high-speed camera equipment is a real possibility. Having to replace entire camera systems can prove quite costly; however, thanks to the design and engineering of the Phantom Miro N-Series, this is no longer the case. Using the CXP cable, the Phantom Miro N-JB base can be safely mounted up to 10 meters away from the head, ensuring that only one component of the system is within harm’s way. In addition, should the camera head be destroyed or suffer irreparable damage, new heads can be purchased and swapped into existing setups at a nominal cost. Additionally, as a part of the Phantom Miro family of cameras, the Miro N-Series is compatible with the Miro Junction Box (J-Box) and can be effortlessly synchronized with other Miro cameras. This allows users to create a modular, flexible high-speed camera system capable of capturing a variety of viewpoints in one scenario or test. Along with the Phantom Miro N-Series, the J-Box works with a wide range of cameras, including the Phantom Miro C210, the Phantom Miro C210J, all Phantom Miro M, R and LC series, the Phantom Miro 3 and Phantom Miro eX4. The J-Box can be used on- or off-board, requires just one power source, and uses a single cable per camera for operating and downloading for a clean, easy-to-use, rugged solution. For additional information regarding Vision Research, please visit www.phantomhighspeed.com.